Many of my module allows use CRON for automatic processing. * / 15 **** / path / to / command. But sometimes is set up cPanel very frustrating… I found a simple ( and free under certain conditions or from $7.95 per Year in paid version) service to set CRON: http://www.easycron.com/ I think it will be sometime easier than setting cron on your hosting. Simply copy and put cron link from my module into “URL to call” and setup time to call (for example every 10 minutes). For each setting you can use own link. Each link are listed in part “Export”, see image. Or you can also use internal PrestaShop module like Crontab for PS or Cron task manager. If CRON link not work usually problem is with parameters after “?” in link. 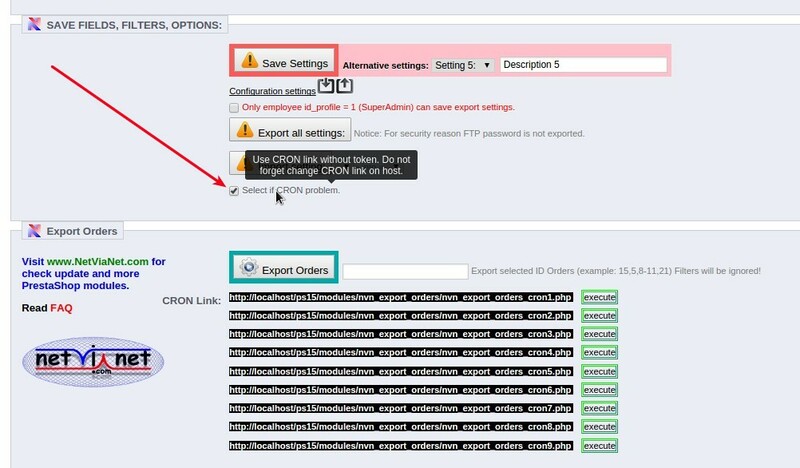 Hi, we’re having problems making the Orders Export module run by a cron job. Does the module not support sites running with SSL certificate (https) ? You’re saying that the option is added from version 2.7.9 – But according to my module the latest version available is 2.7.3 ?